We're on a roll with the free books. In case you missed last week's giveaway of Little One, we have the perfect solution! 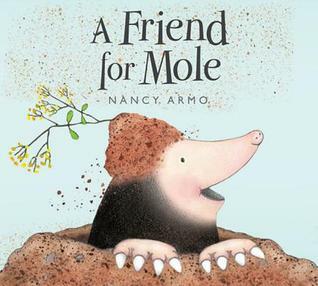 Starting today we will be giving away TEN copies of A Friend for Mole by Nancy Armo. It's Free Book Friday, after all. Struggling with his overwhelming fear of the unknown, Mole stumbles across a friendly Wolf who is trying to conquer fears of his own, and the two discover that friendship can be one of the strongest shields against fear. With simple but humorous text, and soft, bright illustrations to guide the way, this picture book is a gentle, fun journey through fear to friendship.